NutraBio 100% Whey Protein Isolate 2lb. 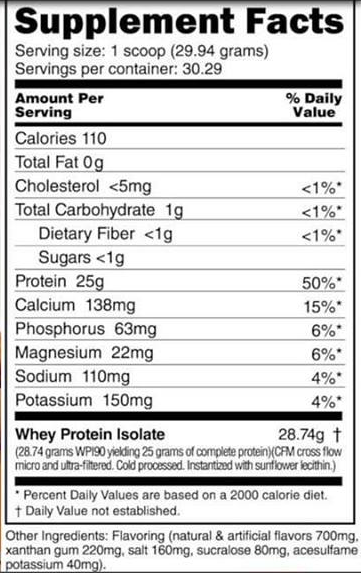 100% Whey Isolate - For 100% Results! Each serving contains 25 grams of complete protein derived solely from 100% Whey Protein Isolate. This supplement has NOT been amino or nitrogen spiked and contains NO whey concentrate, maltodextrin, dextrose, creamer or other fillers. This whey protein isolate provides the perfect amino acid profile required for optimum nitrogen retention, protein synthesis and muscle growth. No fillers, no protein spiking, no proprietary blends, no inferior proteins, no acid treated whey, no maltodextrin or dextrose, no added carbs or sugars, no artificial colors, no hidden ingredients. *Suitable for lactose intolerant individuals!